Tonight I ran Fiasco for the Monday night Skype game. It was… interesting. We recently got a whole bunch of Fiasco PDFs for Christmas (thanks John!) and the low/no prep characteristic of the game appealed to me for “hip pocket” games run at the last minute. Because our Monday Night Skype group was having some scheduling problems, I thought I would try setting up a room in Vyew with a quick start version of one of the scenarios so that I would have something to offer on a night when the regular game couldn’t run. B’hludd (Half-Ork Ranger) – B’hludd joined the adventuring party with his friend Dies to try to raise money to buy and open a tavern. He was bound by a blood ritual to Elshara, and was trying to track down Lilith for a bounty, but was unaware that Lilith wasn’t a woman. He was also questing for the legendary Blade of Calamity, rumored to be in the dungeon. Unbeknownst to him, his old master, now a mummy, was the big bad in the dungeon. Dies-Between-Battles (Kobold Monk) – Dies had joined the adventuring group seeking loot with which to purchase a tavern with his friend B’hludd. Mike the Fighter had killed his father, though he doesn’t know that. He had won Elshara in a poker game and she now served him as a thrall. Elshara (Elf Cleric/Mage) – brought along by Dies, she arranged for Lilith to join the party and hired him to assassinate Dies. She was bound by a blood oath to B’hludd. She was also seeking a magical ring on the finger of the big bad, a mummy who was her old master. Lilith (Human Assassin) – hired by Elshara to assassinate Dies-Between-Battles. Trying to show up Mike the Fighter and take over leadership of the group, and outdo him in heroics. Unbeknownst to him, B’hludd is pursuing him for a bounty. Claims to be a rogue. Mike the Fighter (Human Fighter) – leader of the group, trying to fend off attempts by Lilith to take over. Wants to outdo everyone, particularly Lilith, in heroics. Wants the Blade of Calamity because he thinks it will make him look badass. Dies-Between-Battles killed his father, though he doesn’t know it. The adventurers met in a tavern and heard rumors of a terrifying and powerful mummy powerfully terrifying a rural community, which had offered a reward for the creature’s demise. The game opened with them staring at a small crypt containing stairs… leading down. Well – it was a Fiasco. The party got together and then separated, fell down chutes, fought mummies, spied on one another, got stuck in a gelatinous cube, and just generally behaved like a typical dungeon party. Act I was going through the dungeon, with Act II planned to be the aftermath. We got as far as the Tilt and Act II without finding out who had the magic ring, though it seemed likely that B’hludd would start Act II with the Blade of Calamity in his possession. Everyone had one heck of a good time, including me. The Vyew set up allowed us to keep track of all the vital information, dice, and relationships even though we were far apart, and the game ran smoothly. I am looking forward to Act II next week. Yesterday I ran a game of “Damon Sainte, PI” for my friend Maureen Pisani and +Sophie Lagace . This is a sporadic campaign I run in the Masterbook system using the Bloodshadows setting, which is a sort of pulp/fantasy/horror mashup (West End Games was always good at mashups). I have a bunch of pregens centered loosely around the character of Damon Sainte, a washed up private detective trying to put his life back together after unknown cultists murdered his family. Last night Damon (played by Sophie) and Cat (a former skinpit fighter turned club owner, played by Maureen. Investigated a strange cult, composed entirely of Sentinals (the Galitia police force) that was capturing and sacrificing criminals to some sort of god of justice. +Sophie Lagace is writing up the game, and there should be a recap shortly. I really like Masterbook, despite its being old and somewhat clunky. For a crunchy system, it does what it does quite well. The cards pack a lot of information into a very small and convenient format – they handle sub-plots, unexpected plot twists, initiative, dramatic skill resolution, give approved actions that shift combat away from “I hit it!” and give bonuses to PCs. The only difficulty with cards is the “oops, I lost one” factor. 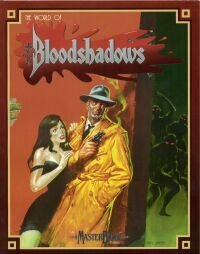 Aside from the old TORG, Bloodshadows is the setting for Masterbook that I like best. Yes, I know that the setting has enough big holes in it to drive a train through, that the setting makes no sense, and all that. Who bloody cares? A lot of the setting (for example the wilderness filled with horrible monsters that keeps travel between the cities at a minimum) is really there as a big fence telling players “The you are in is the boundary of the campaign. It’s a city campaign. The entire rest of the world exists only as context.” Putting big, tough monsters out there for the PCs to fight may not have been the best idea (if you stat them, the PCs WILL KILL THEM) but it serves to give the GM and the players an idea of the actual campaign boundaries. Trying to make spells or other FX in Masterbook is its one big drawback. The system for figuring out effect number, feedback, casting time, etc. is at once both amazingly comprehensive, and horrifyingly inadequate, while involving enough calculations to land a rover on Mars. Thankfully (oh yes, thankfully) West End was kind enough to supply a whole bunch of pre-made spells for various systems. So far as I have been able to tell, if you have spells from Torg you can happily use them with little modification in Bloodshadows and save yourself the time and effort of doing your taxes multiple times per character. The resolution mechanics, while being a bit confusing at first, are easily grasped by players after only a few go arounds, which is a real relief. All in all, I have had a lot of fun with Damon Sainte, PI, and consider it one of the more successful campaigns I have ever developed. I AM considering giving a try at converting the characters to D6, just because I have the D6 Bloodshadows and I think it would make an interesting comparison, but I have a feeling that it wouldn’t give the same depth and variety of characters.